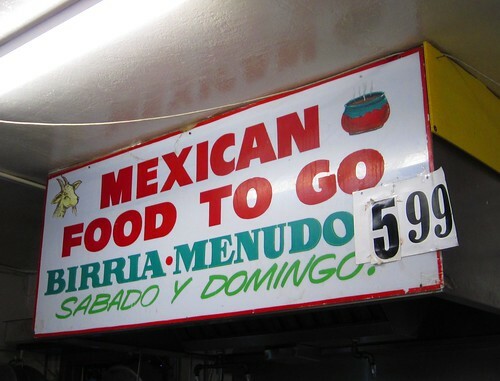 Keeping with the theme of tacos inside mercados I went to La Fortuna market in Culver City. The back of this market has been converted into a small taco counter serving up tacos de birria, carne asada, lengua, carnitas, al pastor,and chicharrones. They’ll even sell you the meat raw to take home if that’s your style. Five bucks will get you three tacos and a jarritos but don’t hold me to that. I may have just lucked out that the clerk had stepped away and the taquero who took my money decided to round down. 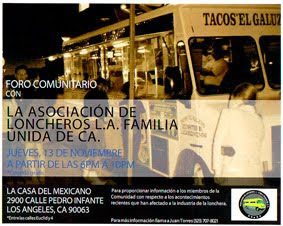 Tacos are $1.15 each. When I asked for two tacos asada and one al pastor the taquero took some skirt steak, cut it into pieces and threw it on the grill. The al pastor was precut and marinated but not cut from the spit so it’s not going to knock your socks off . Skip the al pastor and try the chicharrones which are in a glass case next to the counter and just begging to be gnawed on. The tacos were quite good. 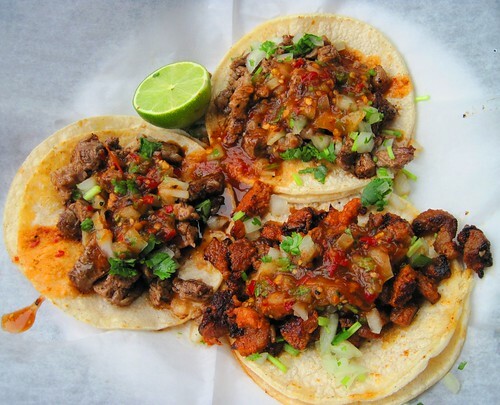 There’s nothing worse than getting a plate of tacos with wilted tortillas and meat that tastes that it has been cooked more than once. These tacos were fresh and the tortillas were piping hot, a must for a great street taco. 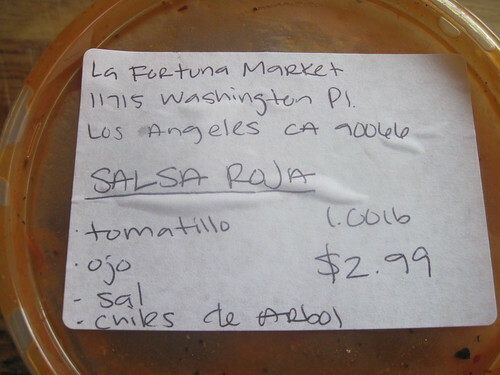 The salsa was also excellent and was placed on the counter in convenient squirt bottles, both green and red. The green, a tomatillo and jalapeno salsa and the red a tomatillo and chile arbol. Their salsa roja is an excellent salsa if you grill carne asada at home(they sell both the verde and roja). I cooked up some skirt steak on the grill this weekend and this salsa was a perfect match with the charred carne asada. One thing I’m curious about though is the “ojo” in the list of ingredients. This market is rumored to close in September 2010 as the building was sold. It is actually in Los Angeles near, but not in, Culver City. Yeah...I have it under Culver City rather than LA because it's so close to Culver City.